Haven’t written anything for a while, but this is something I just had to share. I just got back from filming the latest edition of the Mobile Industry Review Show (live from the T-Mobile event) and I was about to go to bed when I found this video in my Google Reader from one James Burland, he of (the quite frankly awesome) Nokia Creative fame. The man has got the iPlayer up and running on his N95! So I did a little digging… and then I found this piece over on Symbian-Freak about how to install etc… and, as well as finding the actual file there, I also found out a few other facts. If your Nseries has Web Runtime (WRT) enabled, you can haz iPlayer. N95ers out there – hit *#0000# – if your firmware is v21 or above, you have WRT enabled. I’ve poked a few friends of mine at the Beeb to see if we can talk to some of the techies there, fingers crossed we’ll be able to bring you a follow up piece over the next few days outlining some of the finer details. So what are you waiting for? Download it now and let us know what you think! What’s the camera like on the T-Mobile G1? Only got as far as the menu system as I'm not in range of a Wi-Fi connection. Looks good though! Installed yesterday and used in anger last night to watch last weeks Mock the Week. Excellent – this is great for a 1.0 product. I believe 3 have set this up so you can use it in 3G coverage as well. Their marketing push for the N96 is that it will work across the 3G network whereas all the other operators will block it. So any users on 3, should have no problems streaming the content over the 3G/HSDPA network. I streamed a whole episode of Charley Boorman over HSDPA last night and it worked without fault. How? I'm in perfect 3 HSPA coverage, but still get the 'WiFi only' popup. And I can't see an option to change the default AP to WiFi. 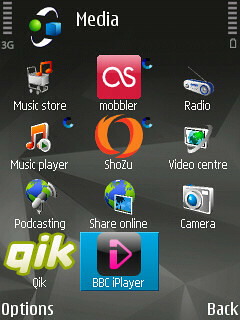 Yep, running beautifully on the N95 8GB, over HSDPA too! Go into RealPlayer > Options > Settings > Streaming > Network. Then make sure that your default AP is the AP you want to use. (i.e. Your mobile provider's APN or your wifi point). Note: For realplayer, you have to follow this manual process everytime you change connection (i.e. change from 3's APN to your wifi. Which can get a bit annoying! Love those BBC Internet blogs! tried a beta and beeb said not compatiable with n95 but this works!